Fact 1, I'm a huge fan of Korean Cosmetics, actually, everything-Korean! ;-D Fact 2, I had a devoted blog site of my fleeting crazy ramblings of Jang Geun Suk, oh well, until I realized that I can't be just a noona or even his ahjumma forever, more so that Sukkie is getting prettier every time. I said this before, there's just so little chance of making him my jagiya even in the drama land (I know right, dream away! ;-D No bashing please. But I really do like him even in his pre-A.N.JELL days in Beethoven's Virus) Fact 3, I'm sold to going all-natural in my skin care, especially that I really do lavishly bathe my skin with them almost all the time. Nature Republic, the latest Korean Beauty brand is making its debut in what is now a highly competitive arena amidst competing Korean Beauty Brands. And it's feeding all my addiction, even my capriciousness for that matter. Last November 11 (11.11.11), they inaugurated their third branch in the county, SM Fairview. Yes, come hell or high water, I made sure not to miss it. Although a relatively newcomer in the Philippines, Nature Republic is a certified bona fide player in the international market. Born and bred in Korea, NATURE REPUBLIC is a new cosmetic brand utilizing state-of-the-art facilities and processes combined with the most natural ingredients gathered from all over the world to produce world-class, superior quality products distinctly and exclusively its own. "Consider some of its precious ingredients, as stated in their tagline, from earth: medicinal plants and healing flowers, seawater from around the world, used as prescriptions from ancient times based on natural concepts and as mother nature intended, processed and formulated through modern technology. Ingredients such as: Blue Lagoon water from Polynesia; Glacial Water from the Alps; Deep Sea Water from Greenland; Ocean Area Pine Tree from France; Hawaiian Hibiscus; Madagascar Butdelria; Morocco Monoi; gold Caviar; North American Kawai; and other similarly exotic and efficacious extracts and substances." Awww...Jang Geun Suk's Eels will fall in love with these! Nature Republic’s main spokesperson and endorser is the popular Korean and International actor and heartthrob Jang Geun Suk (JGS/Sukkie to his fans ;-D), whose following not only spans his own body of artistic work but the products he personally vouches for, particularly, NATURE REPUBLIC. He's also joined by Goo Hara, Park gyuri and Kang Jiyoung of KARA. More opening day gifts...Super Origin Collagen BB Cream, UV Lock Ultra Milk Sun, Snail Therapy Mask Sheet ( I tried this. Love it. ), The Bamboo of Damyang Moisture Fluid and Balancing Toner. Such is their popularity that the Aloe Vera Soothing Gel has already sold over 2 million since being recently released in the market...no joke here, it's just Day 1, SOLD OUT! I'm out to try one of these next time. Nature Republic Snail Therapy lines come highly recommended. And I know first hand, the goodness of snail mucin. Escargot love! ;-D In this line is the popular Snail Therapy Hydro Gel Mask, that utilizes the benefits of mucin (the healing and moisture-retaining extract from snails), antioxidants, and other high quality therapeutic ingredients to intensify the moisturizing process and improve skin elasticity, is an innovative product while in keeping with NATURE REPUBLIC’s the from earth principle. Perfume Lip Balms. Pretty Tree Auto Lip Liners. Swatched. Lip Liners come with a lip brush. I love the versatility I made sure to get one. Awww...I just had to take my picture with JGS. 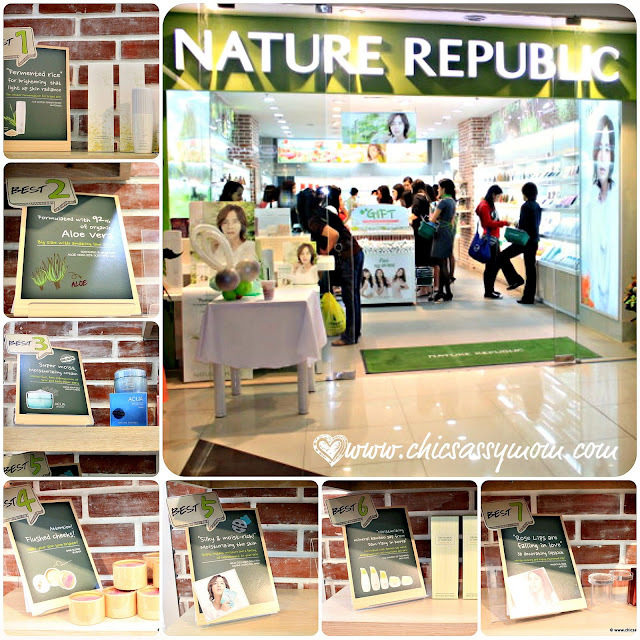 ;-D Thank you so much to Nature Republic Philippines for having me. I appreciate the accommodation albeit missing the scheduled event. plus the whole SA's of the branch for commendable customer service. Bag1. Freebies...ala Press Kits. Included are Fresh Farm Peach Foam Cleanser, Fruits Green Grape Body Lotion, Peach Shower Gel, Aqua Collagen Solution Marine Hydrogel Eye Patch, Vanilla Sky Pact, Brightening Mask, Snail Therapy Mask Sheet. My Nature Republic Haul...Bag 2 & 3 include Nail Polish and Remover, Hand Me Love Steam Masage, Petit Cherry Rouge Moisture, Glossy, High Color (I'm wearing it now! Super love it. ), Pretty Tree Wood Eye Liner, Pretty Tree Lip Liner. So yes, I'm swarmed with product to try. ;-D I'm actually already using several of them. For more details, and seasonal promotions, please visit the official FB page of Nature Republic Philippines. I've been waiting for that store to open for the longest time! I super love Park Gyuri of KARA and I'm a fan of Jang Geunsuk as well, so I'm excited to try the products that they're endorsing. I'm definitely going to buy their snail products. kainggit! you were able to become one of the bloggers they invited. pero ok lang. my money went a relatively long way sa shop nila, which is a good thing :) ok din yung freebies. wish ko lang 2 sachets nung sun cream haha XD feeling ko kasi bitin ma-try pag 1 sachet lang. pero hey, at least i got nice free product samples :) mabait nga yung mga SA nila. Ohhhhh I need this!! Specially with Jang Keun Suk!!! Argh!! In my country i don't have this shop! Damn' !! Hi! I was searching for Nature Republic ad materials (the ones with JKS on it) and I saw your blog. The photos are realy nice... I was wondering if I can use your pics on my blog too although what I'll be writing is mainly about JKS (I'll give proper credit naman po). Hi! Surely! :)) I appreciate that you'd asked. Thanks.